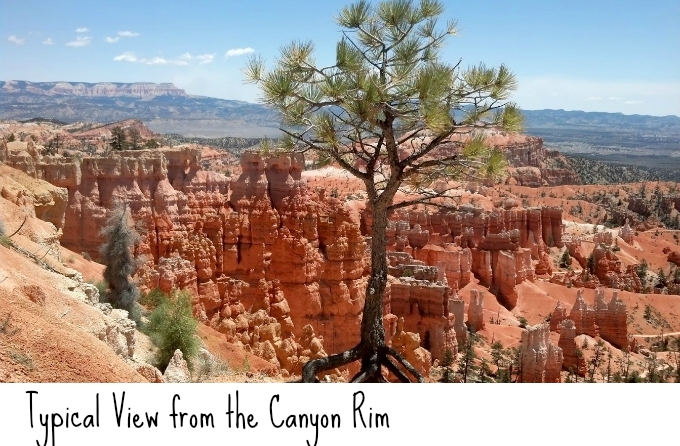 Our last day in southwest Utah is the best of the lot, a trip to Bryce Canyon National Park. National parks are like the story of Goldilocks. Most, like the Grand Canyon and Yellowstone are way too big for a day trip. There aren’t many that are too small, but a few are just right. Bryce is one of these. Ebenezer Bryce, a Mormon settler discovered the canyon while chasing down a wayward bovine and remarked that it was “A hell of a place to lose a cow”. The canyon really isn’t a canyon, buy part of the Giant Staircase that extends horizontally about 150 miles from the north rim of the Grand Canyon in northern Arizona to the top of the Paunsaugunt Plateau in southern Utah. The “steps” are abrupt vertical walls which connect wide plateaus. The cliffs average about 2000 ft elevation change. Depending on the orientation of the step to the prevailing wind, the red sandstone can be carved into towering, fantastic shapes. 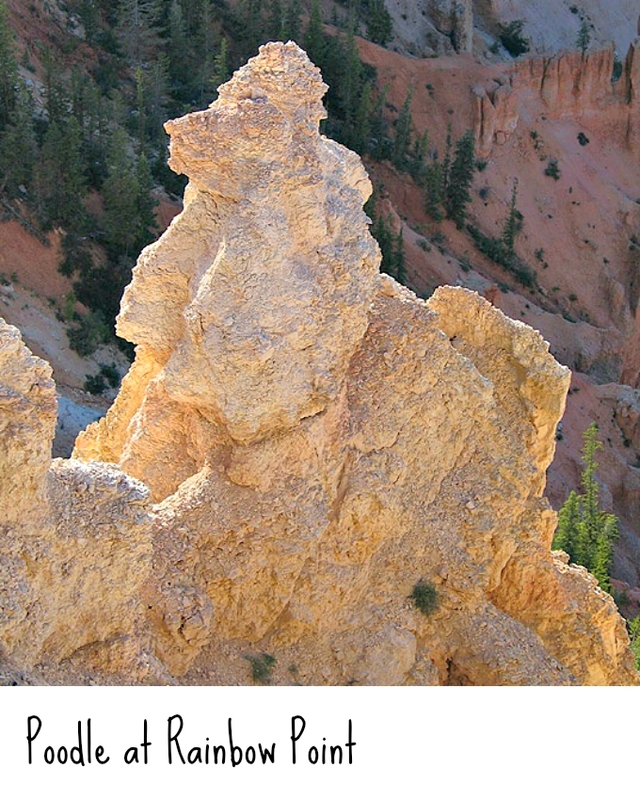 Bryce features nearly 30 miles of paved roads that snake along the rim of the canyon. There are dozens of places to pull off and nearly everywhere you stop has an incredible view. The canyon wall has been carved by wind, and frost into whimsical shapes with colors that must be seen to be believed. These pillars are called Hoodoos, but I’m not sure why that is. Some are quite famous for looking remarkably like people or other things. Bryce is remote. It is about 150 miles from St. George, and will take you about two and a half hours to drive. The roads are pretty good as you take I-15 north for about 85 miles, then Utah State Road 20 west. Follow SR-20 about 20 miles, then take US-89 south another 80 miles to Utah State Road 12 which goes to the park. Because of the distance, I don’t recommend Bryce as an according-to-Hoyle day trip. It’s better to do drive up from St. George and spend the rest of the day at the park. We then stayed the night right outside the park and returned the next morning before leaving in the early afternoon to drive south to the Grand Canyon. Bryce used to be uncrowded because of its remoteness. 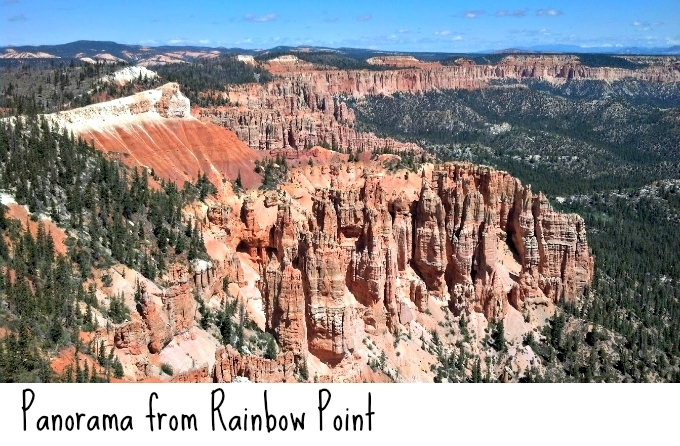 However the Japanese have made going to Bryce Canyon a “must do” on their North American trip itinerary along with Niagara Falls, San Francisco, New York and Vancouver. They take tour buses five hours from Las Vegas and assure that the park and its roads are much more congested than they were when I came here 30 years ago. Bryce is high country. The rim of the canyon is 8,000 to 9,000 ft. above sea level. The weather is cooler on the rim than it is down in on the floor of the canyon which can be 1,000 to 2,000 ft. lower. Be careful if you are susceptible to altitude sickness. My 28 year old son got deathly ill when hiking back out of the canyon when he was 10 years old and I had to carry him up the last 500 feet. I felt like Sam Gamgee lugging Frodo up the slopes of Mt. Doom. Because of the elevation, you also have to be mindful of the seasons. Snow comes early and heavy here. June to September you are probably ok, but just because it is beautiful in Vegas doesn’t mean you might not be hip-deep this high up. The trails tend to get muddy in the spring due to the snow melt which is also not pleasant. Come here in high summer if you can. Also, BRING WATER. The air is thin and dry. Your best protection against altitude sickness is to stay hydrated. At least one liter per person in your packs. There is a town outside the park called Panguitch with convenience stores. Stop here for food and water before you go into the park. There are three basic colors, the red/orange of the rocks, the blue of the sky, and the green of the few hardy trees. They make for can’t miss photography. There are probably ten good places to pull off the road and park. All the views are similar, but unique. Go to Inspiration Point and be inspired. Go to the Natural Arch and feel natural. Go to Rainbow Point at the very southern point in the road and enjoy colors that you can’t see anywhere else. 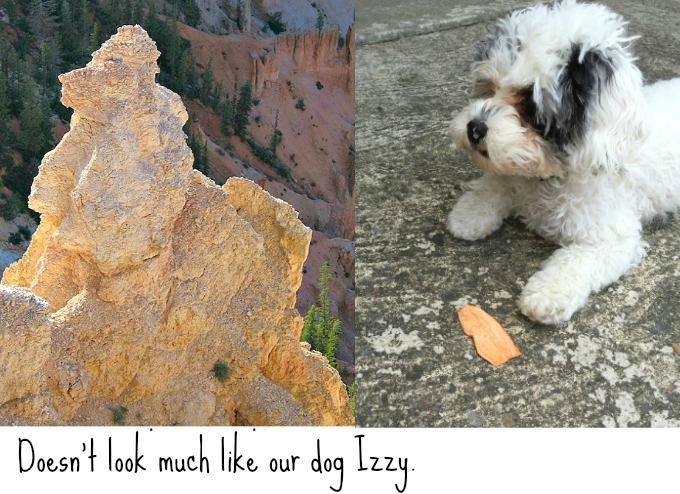 They even got a hoodoo that looks like a poodle. As you can see, Bryce is more intimate than the Grand Canyon. Here, the views are measured in feet, not miles. If you liked the view from the rim, just wait until you hike down into the rocks. Things are about to get a whole lot more intimate. Unlike the Grand Canyon, you can hike down into Bryce, spend a few hours, then hike back out. The trail is strenuous, but not life threatening. Remember to have sufficient water. You descend the rim wall by way of switchbacks. As you go down, the hoodoos tower above you. It is surreal. Park at the large lot near Sunset Point. Hike down the switchbacks to get to Wall Street. As you near the bottom, the sky is blocked out except for a narrow strip of blue straight above you. The trail winds along the bottom of the rim providing fantastic vistas at every turn. Take the side trail towards The Queen’s Garden. 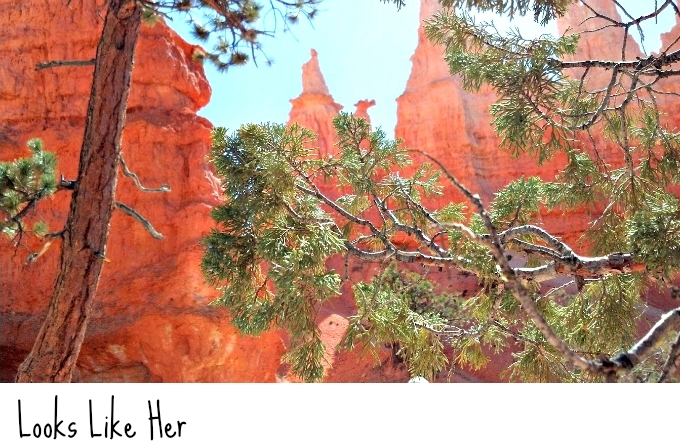 At a certain point, look up at one of the hoodoos that looks just like Queen Victoria out for a stroll. After about two miles of nice flat hiking, it’s time to climb back out. Go slow and take breaks along the way. 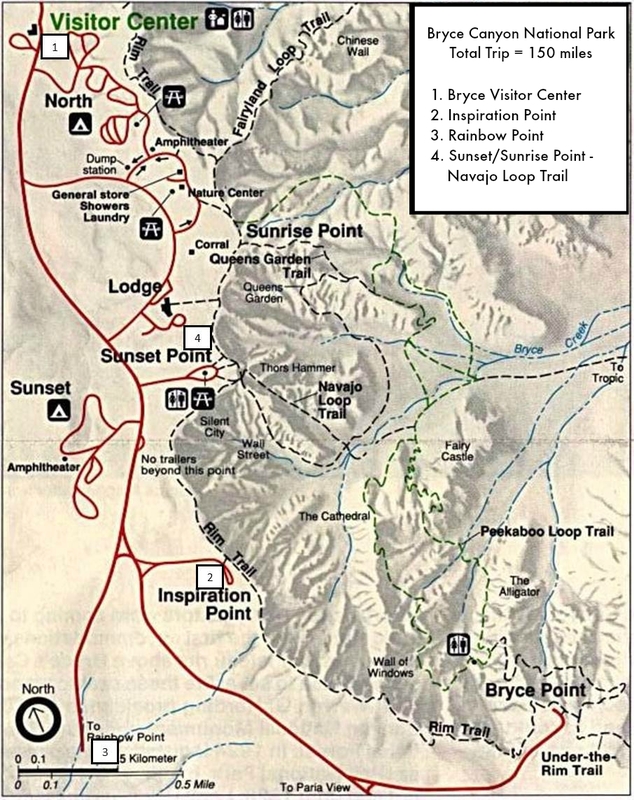 Take the rim trail from Sunrise Point back to your car at Sunset. Along with the Mist Trail in Yosemite and Prismatic Pool in Yellowstone, this is one of the best hikes of all time. Meet the Rick behind “Day-tripping with Rick”. He’s a nuclear engineer who designs power plants which gives him the opportunity to travel all over the world. Rick has collected some of his favorite trips into informative and interesting posts that go beyond the guidebook recommendations. 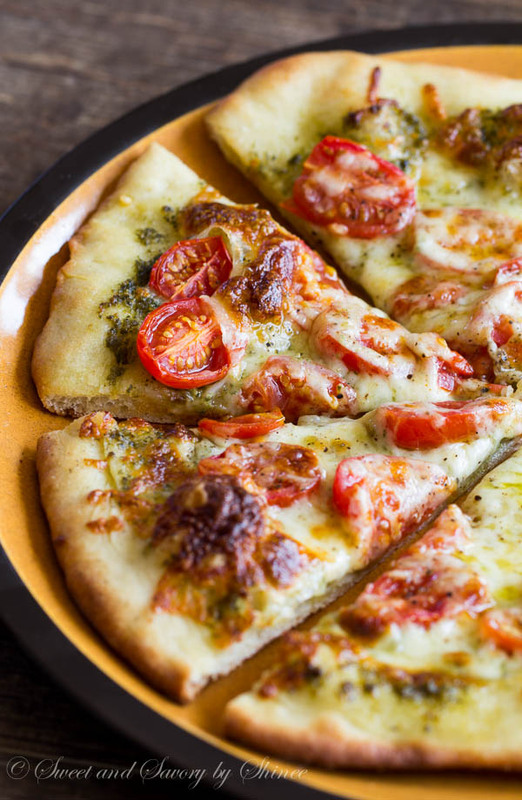 His wife Denise has a successful food blog where Rick occasionally guest-posts, using his many years of travel adventures for inspiration. 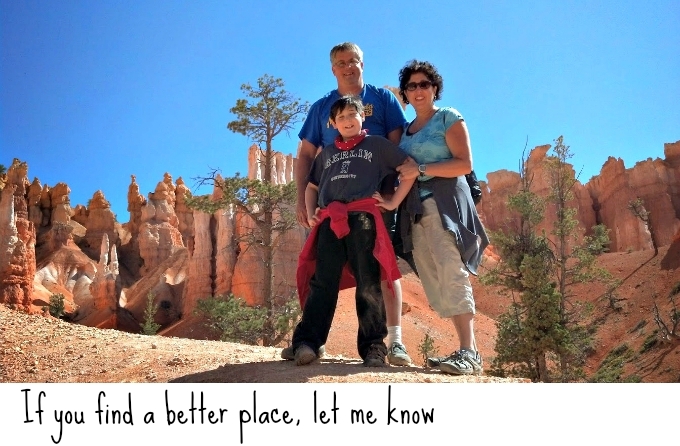 A life-long Pittsburgher, Rick spends much of his time supporting the Steelers, Penguins and Pirates, and having fun with Denise and his son, Max. Rick also has two older children, Laura and Ricky, and two grandchildren (with one on the way). 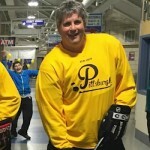 When not posting or making electricity, Rick likes ice hockey which he has played for over 40 years. Although he’s too old, he keeps going out there. 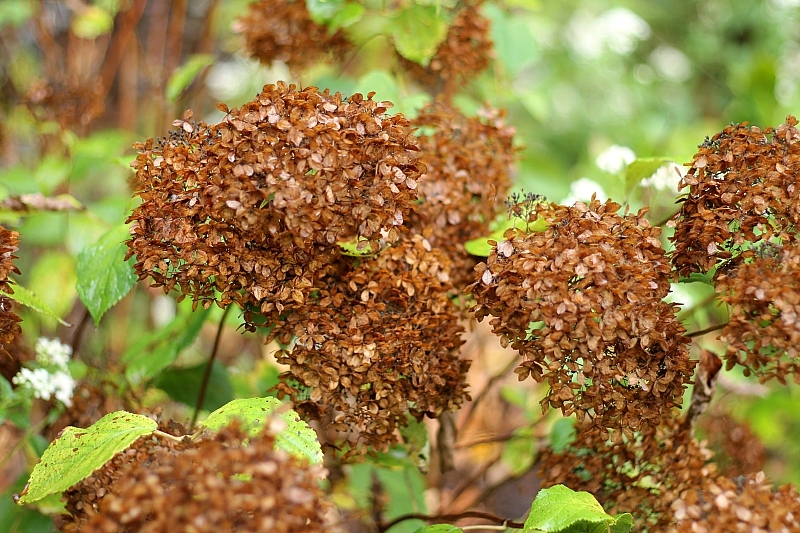 Pruning Perennials: Fall or Spring?